Secondary school students across Ireland have called for a mass protest next month to demand Government action to tackle climate change and our growing emissions. The protest is planned for 15 March to coincide with a global day of protest known as the School Strike for Climate Action. Possible measures that the students are considering include striking outside Leinster House, in front of school gates and outside local government buildings. 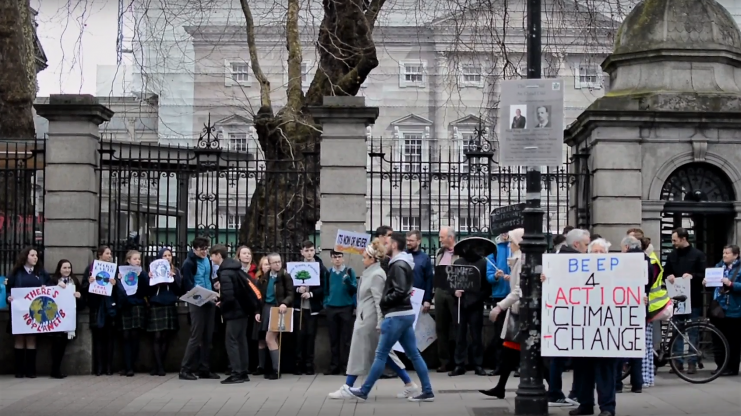 The action comes on the heels of last month’s Children’s Rally for Climate Action held outside the Dáil, where hundreds of young protesters called on immediate action to address climate change. Students inspired by 16-year-old Swedish climate activist Greta Thunberg have also started gathering before political institutions across the country every Friday to demand a stronger commitment to climate action. Schools in counties Cork, Wicklow, Dublin, Kildare, and Limerick have already signed up to take part and organisers are hoping to expand into a Schools’ Climate Action Network. The network aims to connect students, teachers and principals around the country who are concerned about climate change. According to Elodie Bonhomme, a second-year student at Cork Educate Together Secondary School (CETTSS), a single student alone won’t be noticed by those in power. “But if there’s a big group of us, students, doing something then it’ll get noticed,” she said. Her principle Colm O’Connor said that young people will unfairly feel the brunt of the impact of adults today that “will affect them for the rest of their life”. The protest, he added, will be an “excellent opportunity” for principals and teachers around the country to promote an “authentic student voice” speaking out against climate inaction. Noel Cunningham, a science teacher the King’s Hospital in Co Dublin said that both teachers and parents “owe it to young people to help them get more involved in protesting about [climate change]. “After all it’s their future that’s being messed with,” he said. With protest planning already underway, the Twitter account @PulltheBrakes has been set up as an initial means of communication for engaged students and teachers. The growing student movement in Ireland is inspired by a growing global movement of young climate activists, in particular, Greta Thunberg. In August, Thunberg sparked an international movement by going on strike from school and sitting outside the Swedish Parliament to demand greater action on addressing climate change.